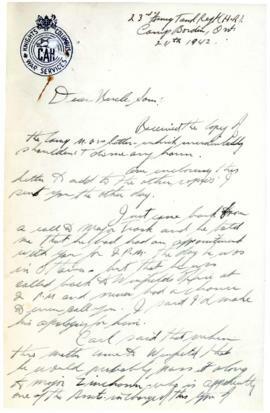 Series contains correspondence in the form of both business letters and personal letters, as well as notes from conversations had regarding the Show by donor Barry Edwards after Bill Lynch’s death. File contains correspondence and a certificate regarding the honorary Doctor of Music awarded to Ellen Ballon in 1954. 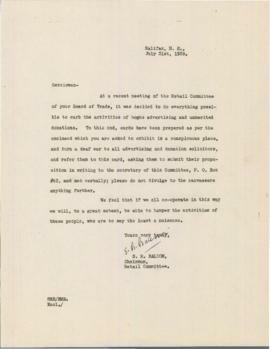 File contains correspondence and a certificate from the Secretary of the Board of Governors of McGill University regarding the proceeds from the Martlet Concert and Ball as well as Ellen Ballon's general support of the McGill music program. File contains a copy of an email from Budge Wilson to her agent, Leona Trainer of the Transatlantic Literary Agency, regarding her nomination for the Molson Award and an annotated copy of Trainer's letter of support for the nomination.